BEIJING (CHINA DAILY/ASIA NEWS NETWORK) - A new high-speed railway linking more than 50 scenic spots in the Yangtze River Delta opened on Tuesday (Dec 25) and experts said it will provide a new engine for the region's economy. The railway linking tourist hot spots such as Zhejiang province's Hangzhou and West Lake, Anhui province's Huangshan (Yellow Mountain) and the ancient village of Hongcun - all Unesco World Heritage Sites - welcomed its first passengers, China Railway Corp said. 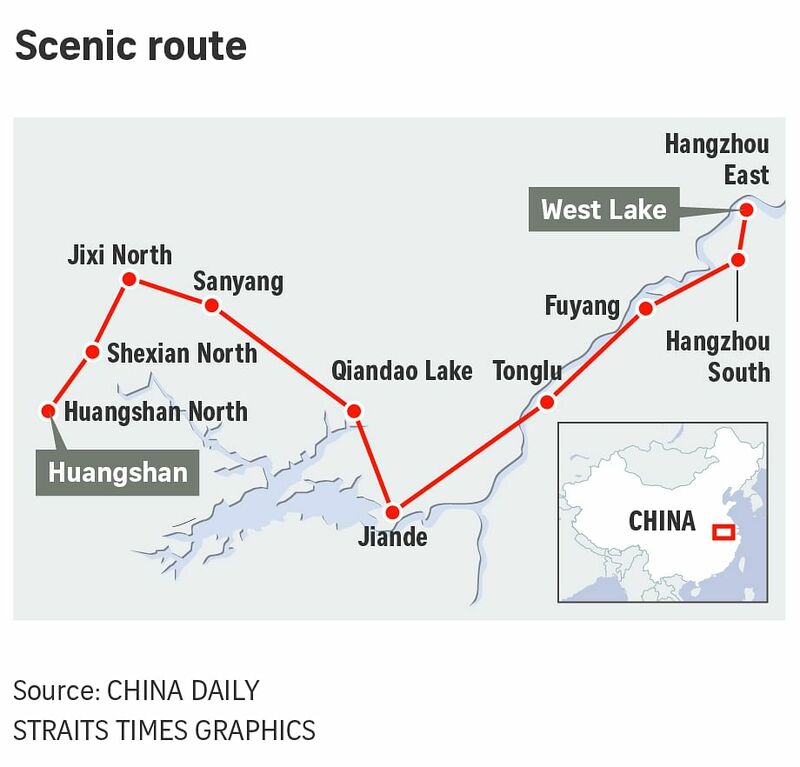 The line will serve as a key tourism route and boost visitor numbers, as there are seven 5A-level scenic spots and over 50 4A-level tourist attractions along the route, the company said. China's tourist attractions are graded on a scale of 1A to 5A by the Ministry of Culture and Tourism, with 5A sites being the most important and best-maintained. "We have had a great number of tourists consulting about our three-day travel package," said Ms Li Qiuyan, general manager of the brand development department of Lvmama, an online travel agency headquartered in Shanghai. The delta region received about 1.8 billion visits last year, earning a total revenue of 3.16 trillion yuan (S$628.7 billion). With the opening of the route and the popularity of the high-speed train, the tourism industry along the rail line will surely witness a huge increase, Ms Li added. The 265km line has 10 stations and trains travel at a top speed of 250kmh. Travel time from Shanghai to Huangshan is only 2.5 hours. Mr Li Jinbo, a 43-year-old resident of Hangzhou, said he was excited to see the rapid development of the line and had looked forward to riding it since construction began in 2014. "I saw the news that the Hangzhou-Huangshan line began to sell tickets yesterday and I booked some immediately. What a rare experience to see many beautiful sites in just 90 minutes and it only costs 115 yuan for a second-class seat," he said. Another high-speed railway linking the cities of Harbin and Mudanjiang in Heilongjiang province in north-eastern China also opened on Tuesday. The 293km line, built in a region where temperatures can fall as low as minus 40 deg C in winter, allows trains to run at 250kmh, according to the China Railway Corp.